What is SociTrafficJet the next hot deal or? 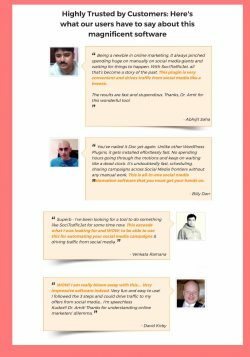 Have you tried posting your links on social media? 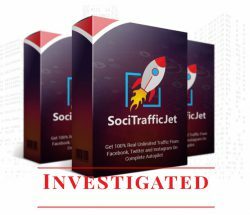 SociTrafficJet does it for you, so you get a flow of traffic from social media for free. We are talking about a WordPress plugin that can help you post on social media. It may be in Facebook groups on Instagram or Twitter. Yes, you buy a plugin for your WordPress website that helps you find places in social media where you can post either your affiliate link directly. As with all other automated tools, the process itself is simple when we talk about it. But you still need some instruction on how to do and what and how you can allow yourself to the different groups. And you’ll get here with video and a little pdf. But that we are talking about groups and your wall on the three regular Instagram Twitter and Facebook, there is no doubt. I have not even explored Instagram so much other than that there are groups here as it is on Facebook. What this is about is to find keywords that fit your niche. Where the tool finds places that suit it. 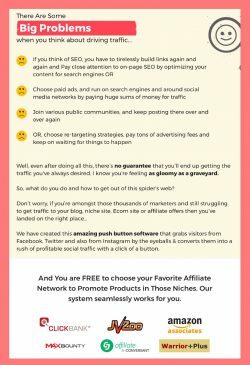 It is an all-around plugin that can help you find groups that are relevant to your specific niche. It can work in conjunction with WordPress, and it is the same platform that I recommend. It can be used as a utility to keep your social media schedule. There is too much hype about it. Social media is significantly challenging to generate traffic through than the organic search. This kind of plugin tends to make your page heavy and slow, even though they are not working on the front page. The only way to drive traffic is to work with its target audience. Here are no shortcuts. Only you who do what it takes. I could go to the owner and get my unique link so I can promote it here. But I’ve chosen to just look at what I see in the browser. As you have experienced with me, I’m not so much about creating automatic shortcuts. Okay, we should not think about what this shortcut could do for you on, for example, Facebook. You enter a keyword in the tool, and it will help you find relevant groups that you can post your article or affiliate link. For example, if you combine it with one of the tools I’ve described earlier. 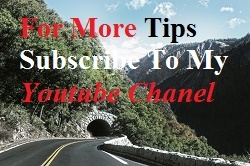 Where you can make articles with video and affiliate link in, you can spammy a lot of groups right away. Here we have a point I like. Teaching on how to use the software and what you can use it for. I may be afraid that you may encounter little more sales after you have taken the first course and put it on your website. I have not met the two men elsewhere than with this plugin. Can be a considerable advantage, for most of the software and app creation. In the beginning, will be more than willing to make their clients feel like they are selling. On the actual sales page and in the videos that users have posted. It seems that you can quickly get hold of the owners. For a simple plugin, the price is reasonable. But when you saw the above, you have to have a page where you can use it. Then the price goes up a bit in the end. I have not purchased the tool yet and probably do not. The two gentlemen behind this tool come from India. Not because I have something special about that country. But I have learned that they are delighted to like what they read and that in comparison to other countries have a culture where very quickly give a similar to yes, almost everything they meet online. It should not mean that I see all that comes from there as spam. No long way, they have a thriving online industry that, like more or less, the rest of the world has. My problem with this is that it is an automatic tool that helps you find relevant places where you can post your links. Enough that it helps you find places you can talk and learn about your niche. You can easily find them by writing in the search box on any social media. As I see it, this is more a suggestion of how you can quickly create social traffic. Subtle enough, you get lots of views in the different groups. But just because you have a plugin that helps you through the keywords. Does not it mean that you create authority at the same time? Do you create authority by covering a need I? I ask you; you will believe me if I only give you a deal without explaining what the pros and cons of the agreement are. To me is a good deal. Especially when we speak info products and software mixed is that you get a tool that you can use to create a whole and not just a part of a whole. If you’re right here, you’re missing a large part of the package, as described earlier, to make you a perfect Marketer. Fortunately, social media are very grateful, and you can develop your behavior along the way even if at some point you have attempted to automate your posts. Yes, there are many IT tools and some work as intended. You may also get this to work. But you need to turn down the pace a lot and get to know people in the different groups and pages you post. Then I’d like to help you further. Read more where and how I work. And no, I do not want you to take your credit card out of your pocket. What I want in return is that you have stopped wasting your time looking for shortcuts to online success. Now you want to know why I have not called this a complete spam product. 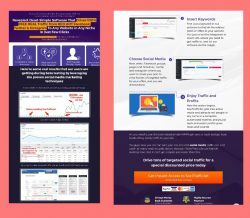 My motive is that it does nothing but a pile of traffic to your link whether it’s blog or an email list that you want people to read or write up on is irrelevant. It can help you find relevant groups and fan pages. But it does not help you much with your behavior in the various media that you can post. Gentle enough to work with groups as long as you know the rules of every team and inside where you intend to make yourself visible. So, it’s very up to you if you’re going to act like spam. It’s also up to you if you get the click on your link. Social groups require little more than just a link. 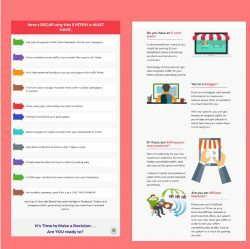 Do you want to create a sale, within your niche? It requires you to be a real person who acts with the other members. 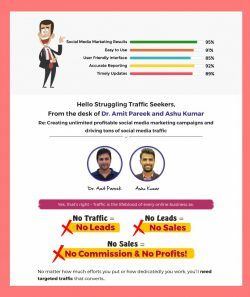 Yes, groups can be an advantageous source of traffic, but just remember that you should be a real help otherwise they are not worth anything. It may be that I’m entirely wrong here. If or if not let’s take the debate in the comments box below. PS while you’re here just give one of the social buttons a push.